Hip abductors are a major group of muscles found in the buttocks including the gluteus maximus, gluteus medius, gluteus minimus, and tensor fascia lata muscles. 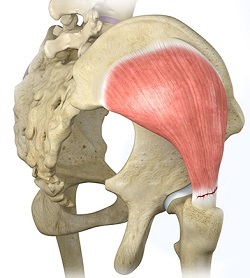 The Gluteus medius arises at the top of the pelvic bone and attaches on the outer side of the thighbone or femur. This muscle controls side-to-side movement of the hip and stabilizes hip movement. A gluteus medius tear is a condition characterized by severe strain of the gluteus medius muscle that results in a partial or complete rupture of the muscle. It is also referred to as a rotator cuff tear of the hip. The tear or rupture of the gluteus medius muscle is commonly seen in runners and athletes involved in high-impact sports such as soccer or basketball due to sudden bursts of activity or poor flexibility of the gluteus muscle. Any traumatic or overuse injury, or degenerative changes may lead to a partial or complete tear of the gluteus muscle. The symptoms include pain and tenderness over the lateral aspect of the hip which may aggravate with activities such as running, climbing stairs, prolonged sitting or walking, and lying on the affected side of the hip. One of the main symptoms of a gluteus medius tear is the presence of the Trendelenburg sign - dropping of the pelvis towards the unaffected side by being unable to bear weight on the affected limb. The Diagnosis of a gluteus medius tear is based on a physical examination of the patient, followed by palpation of the affected muscle, testing muscle power and assessing the walking pattern or gait of the patient. Certain special tests such as the single-leg squat test or a positive Trendelenburg sign confirm the Diagnosis of gluteus medius tear. Sometimes, an MRI or ultrasound may be helpful to show the pathological changes of the muscle. Untreated cases of a gluteus medius tear may result in gait disturbance and disability. The aim of treatment is to restore the normal function of the gluteus medius tendon. Rest your hip by refraining from activities until it is healed. Apply ice to your hip to reduce pain and inflammation caused by the injury. Compression with an ACE bandage helps to reduce tenderness and swelling. Elevation involves keeping the affected hip raised above your heart to minimize swelling. Medications such as non-steroidal anti-inflammatory drugs (NSAIDs) or steroid injections may be given to reduce the pain and inflammation. Assistive devices such as a cane or crutch may be used temporarily to facilitate pain free ambulation. Your surgeon may recommend physical therapy to strengthen the muscles and increase stability of the hip. Surgical treatment may be recommended to repair a complete, full-thickness gluteus medius tear. The rupture can be repaired arthroscopically to help restore the strength and function of the gluteus medius.